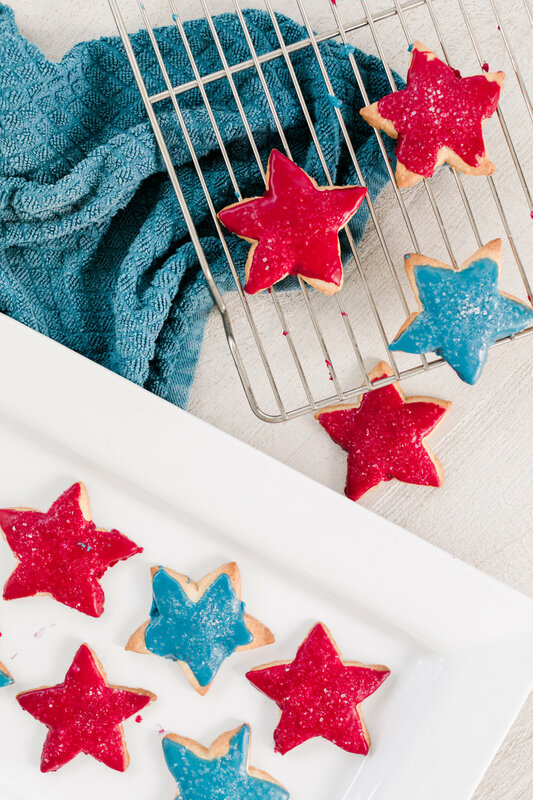 Pamela's Sugar Cookies with Royal Icing - Perfect for your 4th of July Celebrations!! Let’s be honest, hosting a gathering is A LOT of work! I love nothing more than hosting friends and family and cooking for them, but I have little hacks to make my life easier! These hacks come in the form of a little help from my friends at the grocery store! This recipe is the epitome of getting a little help! I used a package of Pamela’s sugar cookie mix (which I found at Whole Foods), and OMG!!!! I’m not sure I’ll ever make my own sugar cookies again! These things were simply amazing!! If I use something store bought, I like to go homemade with a component of it. For this I did homemade icing! Now I know my decorative icing skills are lacking, but it was my first time trying these. You could absolutely add less coconut milk in order to have a thicker icing. I also used vegetable dyes from Whole Foods in order to achieve these colors. Follow package instructions. Once dough is prepared, place in the fridge for 30 mins. Transfer to a cool clean surface and roll out dough. Use a star cutter and an offset spatula to cut cookies. After baking transfer to a wire rack to cool completely. Place confectioners Sugar in a bowl. Add vanilla, then slowly add milk. It doesn't look like there's much, but a little goes a long way! Once cookies are cooled, dip them in icing and place on a rack with a pan underneath in order to catch the drips. I topped these with some sanding sugar. Honestly, these are the best sugar cookies I’ve ever had, and I hardly had to do any work! ~ You can sift your sugar in order to make sure there are no lumps. Again, I know my icing game needs some SERIOUS help! If you've got some tips, please send them my way!